After a long day, nothing may be sweeter than finding that rare, blissfully still moment to cuddle with our children and read a beautiful picture book. Not only do they entertain, but great picture books introduce us to new ideas, new cultures, and new places. And we probably all fondly remember a handful of picture books from our childhood. With this in mind, next week, the Association for Library Service to Children (ALSC), a division of the American Library Association (ALA), will honor the artist of the “most distinguished” 2016 American picture book for children with the Caldecott Medal. 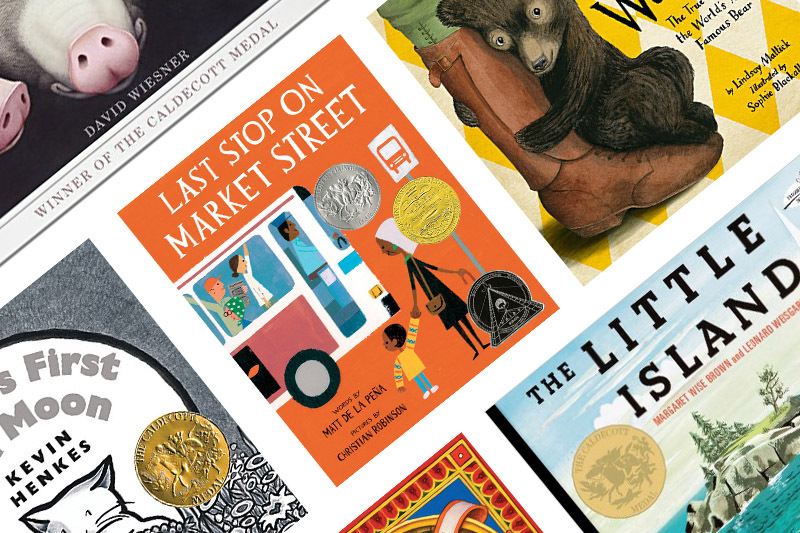 One of the most well-known awards, the Caldecott Medal has been given out since 1938 and is the second oldest award for children’s literature after the Newbery Medal, awarded since 1922. And, of course, parents buy them, too. “Because parents look for things that have been approved by professionals when they are making decisions on what books to bring into their households, those books shout, ‘I have the gold medal seal of approval by a group of people who’ve been elected for their expertise in this arena, so you can’t go wrong with me,’” says Mercier. Last year’s Caldecott Medal went to Sophie Blackall for her illustrations in Finding Winnie: The True Story of the World’s Most Famous Bear, written by Lindsay Mattick. A story ideally suited for children ages three and older, Finding Winnie is a narrative embedded in a narrative, in which a mother tells her son the story of Harry Colebourn, a veterinarian on his way to serve in World War I who finds and cares for a bear cub, the inspiration for Winnie-the-Pooh. Since 2000, there has been a range of art styles and media in Caldecott Medal winners, from modern abstract styles to classic woodcuts, explains Kathleen T. Horning, director of the Cooperative Children’s Book Center at the University of Wisconsin-Madison. Illustrations in the 2009 Caldecott Medal winner, The House in the Night, for instance, are rendered in scratchboard and watercolor, while in Kevin Henkes’ Kitten’s First Full Moon, one of Horning’s go-to books for new babies for its rhythm and quiet harmony, illustrations are rendered in gouache and colored pencil. In the 2002 Caldecott Medal winner, David Wiesner’s The Three Pigs, the style changes as one flips the pages. “The Three Pigs plays with art as the style changes throughout the book, depending on which story the main characters have wandered into, and, ultimately, it breaks the fourth wall as the pigs use the book’s pages to make a paper airplane and fly away,” says Horning. And in recent years, what has been considered and awarded as a picture book has shifted and expanded to include recognition of more and longer words of nonfiction and also graphic novels. “In the past 16 years, we have seen Caldecott Medal-winning books that are fantasy, nonfiction, fantasy, humor, longer works. The Invention of Hugo Cabret [winner of the 2008 Caldecott Medal and ideally suited for kids ages 9 and older] is over 500 pages long,” says Horning. There’s also been a rise of the wordless book, which can be traced back to David Wiesner and some of his fewer word books, like Tuesday, the story of flying frogs invading a small town, which is told mainly through illustration and won the 1992 Caldecott Medal. “Started in a time when African American authors and illustrators were typically overlooked for the Newbery and Caldecott, [the Coretta Scott King Book Awards] were originally meant to encourage these authors and artists,” says Horning. “Today there is frequently overlap among the awards, and the King Award winners always represent some of the best books of the year.” For instance, the 2016 Newbery Medal winner, Last Stop on Market Street, written by Matt de la Peña and illustrated by Christian Robinson, was also a 2016 Coretta Scott King Illustrator Honor Book. The ALA Youth Media Awards take place on Monday, January 23 at 8 a.m. ET in Atlanta, Georgia and will be streamed live. The lists of finalists are confidential, so your guess is as good as ours as to which books will take home a prize. Do you have a favorite picture book from 2016? Let us know in the comments below.